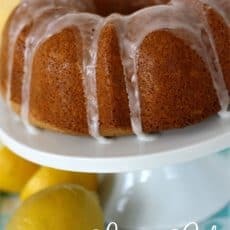 Lemon Bundt Cake - Moist Fluffy and Delicious! 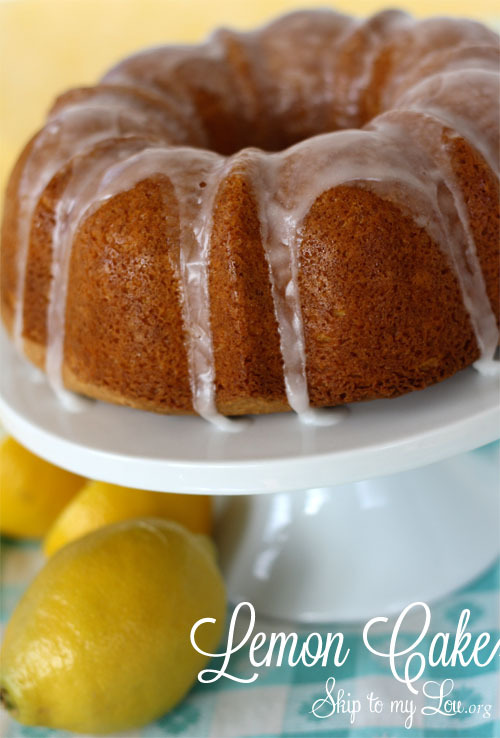 Home » Recipes » Sweets » Lemon Bundt Cake Recipe – Fluffy Moist & Delicious! Lemon Bundt Cake Recipe – Fluffy Moist & Delicious! This Lemon Bundt Cake recipe starts with a cake mix. It is so simple and so delicious. If you are like me I like the ease of starting with a cake mix. If you love lemon this is the cake for you! You find everyone loves this cake. Since it starts with a cake mix it is a breeze to make. This lemon cake is light fluffy and super moist. The lemon cake and lemon jello give it an amazing lemon flavor! In no time at all, you can serve up an amazing dessert. Make it into a lemon poppyseed cake by adding a couple tablespoons of poppy seeds. 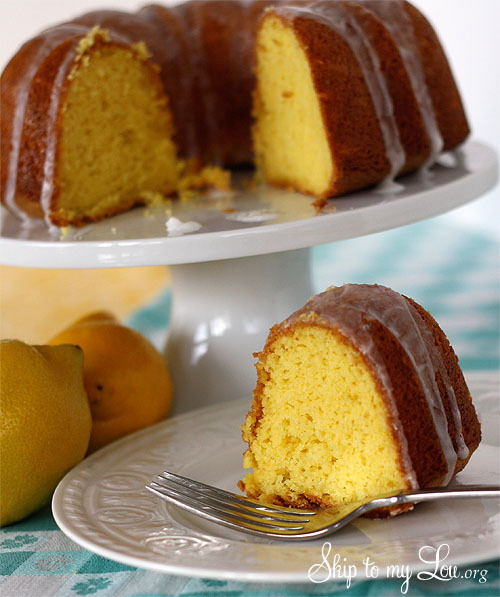 This lemon bundt cake is a great go-to easy cake recipe. Bursting with lemon flavor gives it a bright fresh taste. I love how moist the cake is! Typically I always choose chocolate first but this recipe is a winner! This lemon bundt cake starts with a cake mix making it a breeze to make. You will love this moist fluffy lemon cake! Mix all ingredients well. Place batter in a 6 cup bundt pan or a 9"X13" pan. Bake at 350 for 30 minutes or until a toothpick comes out clean. 2 cups powdered sugar and 1/4 cup freshly squeezed lemon juice (about 1 to 1 1/2 lemons). Be sure to not overbake. Bake until toothpick inserted comes out clean. While the cake is still warm make a simple glaze out of powdered sugar and freshly squeezed lemon juice. Pour lemon glaze over the baked cake. More Cake (cookies and bread) all with a cake mix! 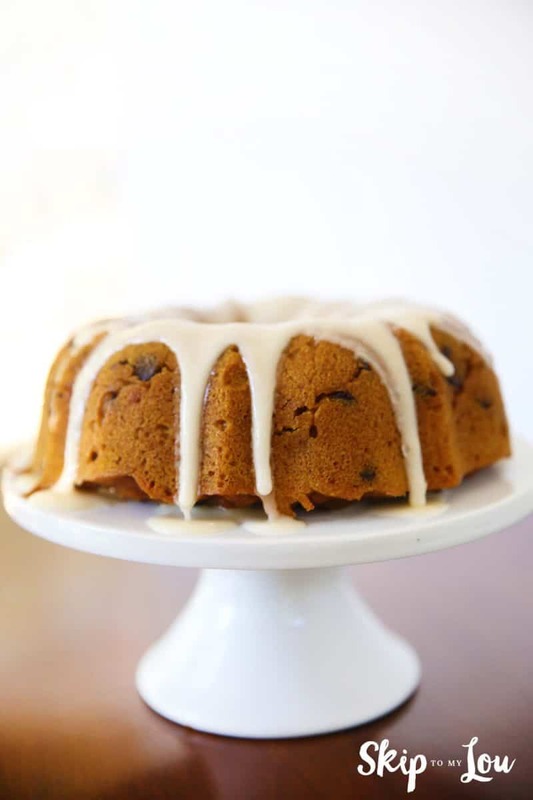 Did you know you can make a bundt cake in the Instant Pot? Love how moist the steam makes the cake. Katy, yes spray the pan well. Baker's Joy works really good for baking. Making it for years....you need to separate the eggs , use yolks in bater and then whip whites to stiff peaks & fold in....Will be taller! This is a great idea Merrianne! Can you use sugar free lemon jello? Susan, I am not sure about the sugar free jello. If you try please let us know how it works! This cake was so moist and scrumptious that I am making it for the third time. I added poppy seeds. Yummy! Thank you Skiptomylou. My cake fell... I don't know what I did wrong. Ashley not quite sure what happened. You might check your oven temp. Make sure you use jello and not pudding. I love any kind of lemon cake or pie. I have been making one for years, 1 Duncan Hines lemon cake mix, 1 lemon instant pudding, 4 eggs, 1 cup water, 1/3 cup oil. The recipe is on the side of the box, check it out, I also make the chocolate like this, the water and oil are a little different, check out the box, they are so moist and wonderful. Our favorite. I remove after about 10 min. Mary, I can't wait to try the chocolate version! Ok i made this cake today and i used instant lemon pudding and its all gummy i let it cook for the 45 to 55 minutes still gummy what did i do wrong??? Cynthia, I used lemon jello. I wonder if that was the difference? This was the first cake I learned to make as a kid...and still make it today 40 years later. It is delicious! The lemon cake has a lot of the lemon flavor so I wouldn't change that out. It would still be good just not really as lemon. How long should you let it cool in the pan before removing? I don't want it to stick. Bonnie, typically about 10 minutes will work. Don't wait much longer because the glaze is best poured over the warm cake. Great idea, but I still need the éclair cake recipe. I will definitely try this one. I love pudding cakes. I do one in green & brown with half of the batter mixed with pistachio pudding & the other half chocolate. Does this work with the new down-sized boxes of cake mix, or is it based on the old box size? I have made it recently with no issues at all! Hope that helps. Other recipes I've found similar to this call for a 3.4 oz box of Lemon Jello *PUDDING*, is it truly 3.4oz of Lemon Jello? it is lemon jello. It makes is slightly tart! So good. I LOVE lemon cake and I'm so excited to try this recipe but I do have one question. I'm just curious, did you use lemon jello or Jello lemon pudding? It is lemon jello! Try it you will love it. I just put a cake in the oven. I think we are having lemon cake for supper! I made a really similar recipe for Easter...I think the only difference might have been the use of a yellow cake mix instead of lemon. LOVED it!!! In fact I ate a lot of it this week! YUM!